OLYMPIA, Washington — Gov. 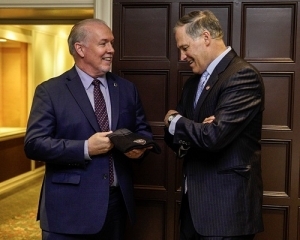 Jay Inslee and Premier John Horgan met last week to discuss regional issues and promote opportunities for collaboration between British Columbia and Washington state. The two leaders committed to act jointly to fight climate change and protect salmon and orcas in shared waters, increase connectivity and transportation links, grow the innovation economy and tech sector, grow mutually beneficial trade and create good jobs for people on both sides of the border. The trip marks the fourth meeting between Horgan and Inslee in the 18 months Horgan has been premier. Inslee addressed the British Columbia legislature in Victoria during a visit November 2017. Horgan’s visit included a conversation with Inslee before members of the Seattle Chamber of Commerce at the Rainier Club in Seattle on Thursday. Horgan also visited the University of Washington and Microsoft. On Friday, the premier was scheduled to give a formal address to a joint session of the Washington State Legislature, however it was canceled due to adverse weather conditions. Read the rest of the story on the governor’s Medium page.